Dr. Marlon A. Smith is a scholar-activist who has over 20 years’ of experience working with community and faith based organizations in the area of community development and outreach. He is the founder of Black Greeks Speak Social Justice and Human Rights Council (BGS), an education and policy studies organization. BGS brings together academic and activist culture for the development of policy and social justice projects. He is also the Senior Manager of Policy and Engagement for Baker Ripley (formerly Neighborhood Centers Houston). Prior to working for Baker Ripley, Dr. Smith served as the Texas State Reentry Manager for the Innerchange Freedom Initiative (IFI). IFI is one of the oldest and largest faith based pre-release prison reentry programs in the country under Prison Fellowship Ministries. As the reentry manager, Dr. Smith developed partnerships with local, state, and national public officials, educators, and advocacy organizations to impact the rate of incarceration in communities of color, and developed programs and policy initiatives to address the challenges previously incarcerated men and women face when they leave prison and jails. While at IFI Dr. Smith helped to reduce the recidivism rate of program graduates to thirteen percent, and increased the number of men enrolled in a college degree program by over 65 percent. Dr. Smith attended Texas Tech University and the University of Houston, earning a Bachelors’ Degree in Journalism/Public Relations with a minor in African American Studies. He went on to earn his Masters’ Degree in Theological Studies from Brite Divinity School at Texas Christian University. He later earned his Ph.D. in Interdisciplinary Studies, majoring in Humanities and Culture with a Specialization in Martin Luther King, Jr. Studies, from Union Institute & University. 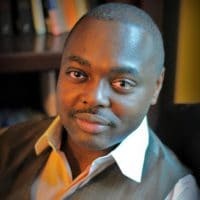 He is also the author of two books: Black Lives Houston: Voices of our Generations and Reshaping Beloved Community: The Experiences of Black Male Felons and Their Impact on Black Radical Traditions. Dr. Smith continues to work with local, national, and international organizations to bridge academic, religious, and activist life for the develop of concrete institutions and partnerships.